I'm traveling with my friend Monica Z to a series of Rush shows on the East Coast and Ontario. Today, we traveled from Seattle to Buffalo, with a layover in Detroit. My day started at 5:40 a.m., which is the earliest I've gotten up in about a year. I drove to the airport, parked in a shuttle lot, and made it to the airport by 7:00. The line at the Northwest Airlines ticket counter was longer than I expected, and the security line was practically a mile. But I made it to the gate by 8:10 a.m.
Monica and I met up on the plane, and we settled in for the 3-1/2 hour flight. As always, we were able to talk almost the entire way about a host of subjects including music, movies, work, and what we were going to do in Toronto and Buffalo. On the way into Detroit, Monica pointed out the patterns of clouds outside the window. 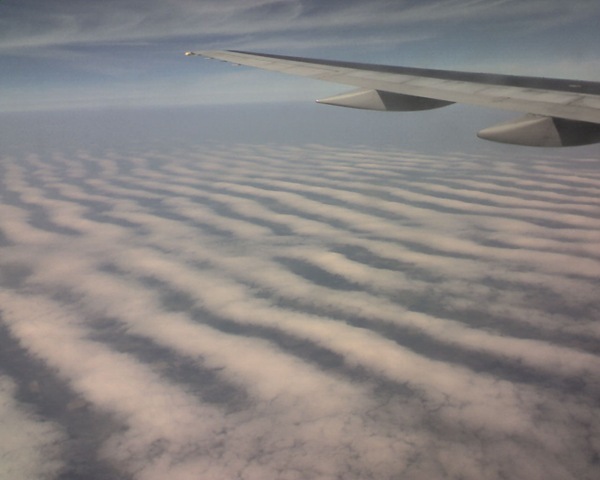 They looked like sand dunes or waves. If you've never been to Detroit, it's probably one of the most futuristic airports in the United States, with its elevated indoor train, myriad screens, and metallic architecture. It seems like it could be a space port. It's also immense. We must have walked a mile to our new gate. When we got to A11, we noticed our departure time had moved back two hours. The guy at the desk said, "I guess I'll tell you what's going on. We've got a broken plane." Monica and I went to eat lunch at Max and Erma's in the terminal. After we ordered, Monica thought she'd better check our flight information again. She went out to the information screen and came back to report the flight had moved from 6:30 to 5:30, which meant we only had about 40 minutes or so to get to the plane. After a few more minutes, she went and checked again, and the flight was now scheduled to depart at 5:10! Needless to say, we grabbed our food to go and ran to our gate. Fortunately, we weren't late, and the plane didn't take off until 5:30 (they'd unloaded the plane's cargo when they found out it was broken, only to have to reload it once the plane was fixed). Monica and I didn't sit next to each other on the flight from Detroit to Buffalo, but I ended up sitting next to a nice older woman from Buffalo, who didn't mind me eating my club sandwich and fries in front of her. We talked about everything, but what I found most interesting was her story about her 100-plus year-old father, who had recently passed away. She told me about how he had dressed, fed, and gone to the bathroom by himself almost until the day he died. When I hear stories like this, it makes me smile. Once we got into Buffalo, Monica's friend Ray met us outside the gate (which was really nice of him). 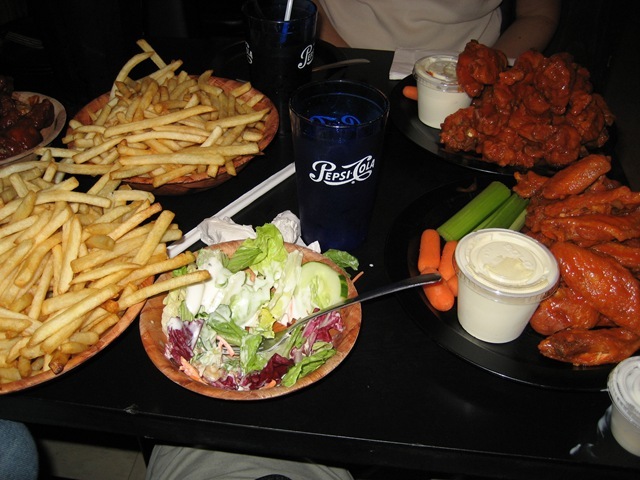 He guided us to our Days Inn motel, and then led us to the place for wings in Buffalo --Duff's Famous Wings. As Ray said, "After tonight, your life will change forever." I'm not a huge wings fan, but I have to say I was impressed with Duff's. We got the medium-level spice, and it had a salty, vinegar twang. I got the feeling from Ray, his friend Kevin who joined us, and Monica, that Duff's is an institution, like Chinook's in Seattle. We sat and talked into the night, even though Ray had to get up for work the next day (Ray says about staying up, "If there's still four digits on the clock, I consider that a success."). He had received the new Rush tribute album Lush, which we listened to and promptly turned off.